Illus. in full color. 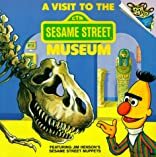 Curious to see a moon rock, Bert and his friends go to the Sesame Street Museum, where they find all the marvels of art, science, and history that a museum can offer, from dinosaurs to Egyptian mummies. This lively book shows youngsters that a trip to a museum can be an adventure filled with discoveries.